The New Century China Nightstand borrows selectively on Asian tradition, incorporating repeating patterns through the liberal use of intricate joinery. Designed to complement our New Century China Bed, the Nightstand offers the same juxtaposition of space and structure with linear elements that call attention to design and construction while bringing definition to the surrounding space. Over three dozen mortise-and-tenon joints are used in the construction of this small piece. 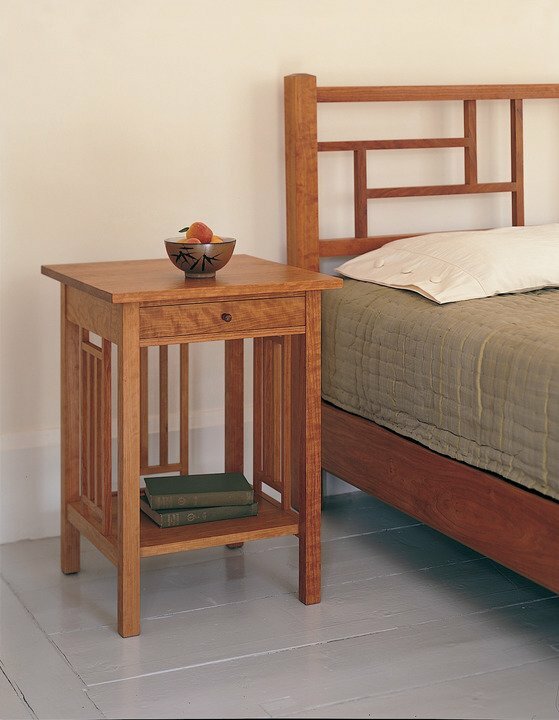 Designed to complement our New Century China Bed, this table provides a drawer and shelf for convenient bedside storage. With its three sides, books and magazines can be stacked high if needed. The drawer of the nightstand makes use of stunning dovetail joinery and is designed to open and close smoothly and reliably for generations of use. Made of sustainably-harvested, hand-selected materials, the wood utilized in crafting each piece of New Century furniture celebrates the beauty of nature, lending its elegance to any bedroom setting.